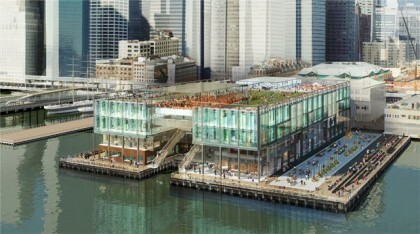 While plans continue to revamp Pier 17′s tourist trap South Street Seaport, it appears that the view across from the Brooklyn Heights Promenade might become all the more dramatic. 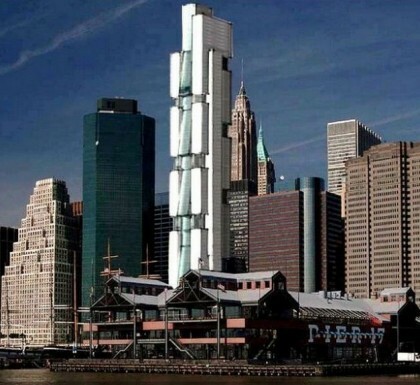 Plans have been drafted for a skyscraper at 80 South Street that would dramatically redefine the skyline as seen from the Heights. In the works is a proposal to erect a 300,000-square-foot, 780-foot-tall mixed-use tower comprising a hotel, residential and community space. Owner Cord Meyer Development is currently working on plans for air rights that it has purchased over several years, while Morali Architects has begun parading renderings for perusal. The design would comprise a high-tech garage on the first three levels, equaling the height of FDR drive; with a small museum above highlighting history of the Seaport; and a restaurant and spa alongside a 200-room boutique hotel. The building’s skin would be made of photovoltaic glass. The plan awaits approvals from the City Planning Commission and the Dept. of Buildings, which could take at least a year.